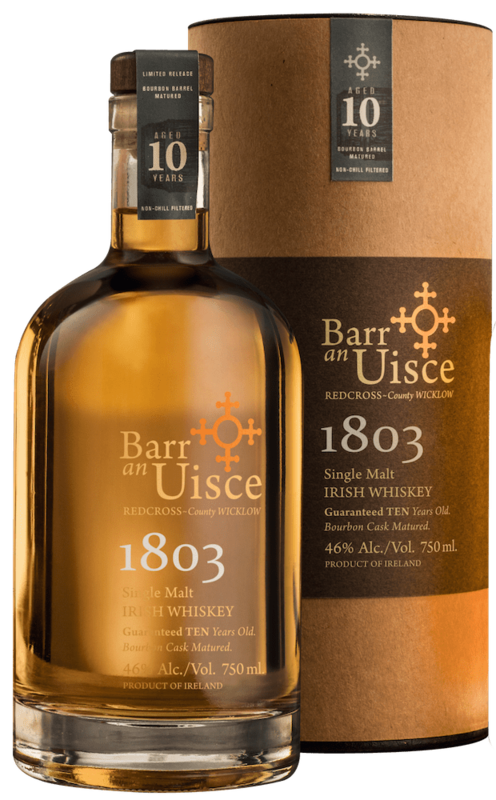 Niche Import Co. has announced the addition to their portfolio of two Irish whiskeys from Barr an Uisce: Wicklow Rare and 1803. Barr an Uisce is a new whiskey purveyor from the small village of Redcross, the company says, which lies just below the townland of Barraniskey on the east coast of Ireland. The Irish words “Barr an Uisce” translate to “above the water.” The Irish word “uisce” was used during the time when Irish monks first distilled what we now call whiskey, the company says, and they referred to it as the “Water of Life”. Wicklow Rare is a small-batched Irish whiskey and Barr an Uisce’s signature blend. It’s matured in first-fill bourbon barrels and finished in Oloroso casks for 6 months. With aromas of vanilla, honey and baked fruits, this whiskey has a mid-palate of nuttiness, raisins and plum, the company reports. The finish includes subtle marmalade and caramel notes. The suggested retail price is $49.99 per 750-ml. bottle. 1803 is a 10-year-old single malt Irish whiskey whose namesake is inspired by the year in which St. Patrick’s Church of Barraniskey was built, the company says. The copper-colored cross still stands in the graveyard in Redcross to this day, which inspired the logo for Barr an Uisce. The mid-palate opens to reveal tropical fruits, cinnamon, ginger and a distinct maltiness, the company reports, with a finish with hints of toasted oak. The suggested retail price is $79.99 per 750-ml. bottle. Both whiskeys are matured in first-fill bourbon casks and cut with water from the Jones’ family well in Redcross, County Wicklow, the company says.